If today’s world were studied from the time of creation until now, we would see it exists because of human feelings of love and forgiveness. Some humans endure oppression from terrible people, but will always try to change the evil hearted to good. This is love and forgiveness. But I have one question for you, dear readers. Are we always able to forgive our oppressors? It is question of conscience, heart, intellect, and wisdom. I think sometimes the answer is yes, and sometimes it is no. Wisdom and intellect direct us to pursue our dreams and goals, despite the obstacles. Wisdom tells us that we were not created to destroy and take revenge. Our hearts direct us to take time to love ourselves, our family, our friends, and our children. We want love. We must try to stay in love—as a brilliant lover would. But sometimes we are heartbroken. Sometimes we love those who do not love us back. But when we feel love and forgiveness, we understand that we were created for a purpose bigger than our anger or any desire for revenge. We were created to make lives for ourselves and the people around us. We weren’t created for whimsy. Some things are a struggle to forgive, like killing and oppression. To forgive this kind of pain we need time. But we know that love and a kind heart should win out. Forgiveness makes a path for us to move forward and develop. Think about a person who steps out of the crowd to offer assistance to someone who is lost. There is a big crowd around her but only one angel comes to help. Think about a father who sacrifices for the happiness of his children and wife. Think about an old and poor gardener who cares for his garden like a newborn baby. He gardens to create happiness. 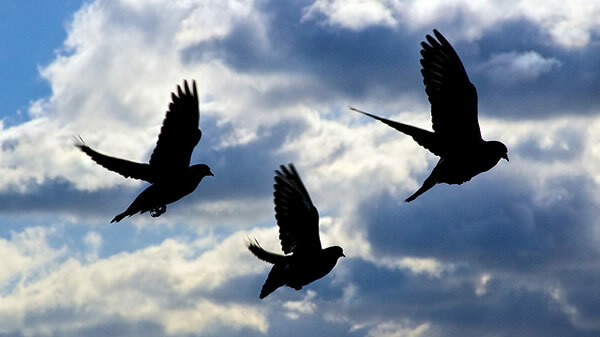 Think about flying behind a group of pigeons in flight and how in our lucky imagination they make us free. With love and imagination, we make ourselves free. When we think on the moments of love and laughing in our lives, our pain and suffering become less important. There is happiness in the smiles of children playing, in moments of peace in my country, in moments of justice and love, in the smile on the lips of my son. There is a brilliant life to be found in small moments and in humble places. When I was a child, I dreamed of going to university but my father had other plans. I was married to a man who beat me and kept me from studying or working. Two and a half years later I was divorced. But I had a son. In him, I found hope and love. I endured the gossip and I took a job. I earned my university degree. I learned to forgive the people who tried to stand in my way. My pains are the lessons that made me hard and strong. My heart has pains, but I don’t heed them because they are not for always. I really enjoyed your writing and your decision for your study. Wonderful lady, proud of other Afghan women. Wish you more success in your life. This is a wonderful essay. Congratulations! I look forward to reading more of your work. This is beautifully-written! I believe no person is entirely good and no person is entirely bad. People do very good and sometimes very bad things, but when we remember that those who do bad are often uninformed or themselves controlled by rules they did not make, it is easier to forgive them. Keep your big heart! It is the greatest asset a person can have! wow, you are an inspiration!